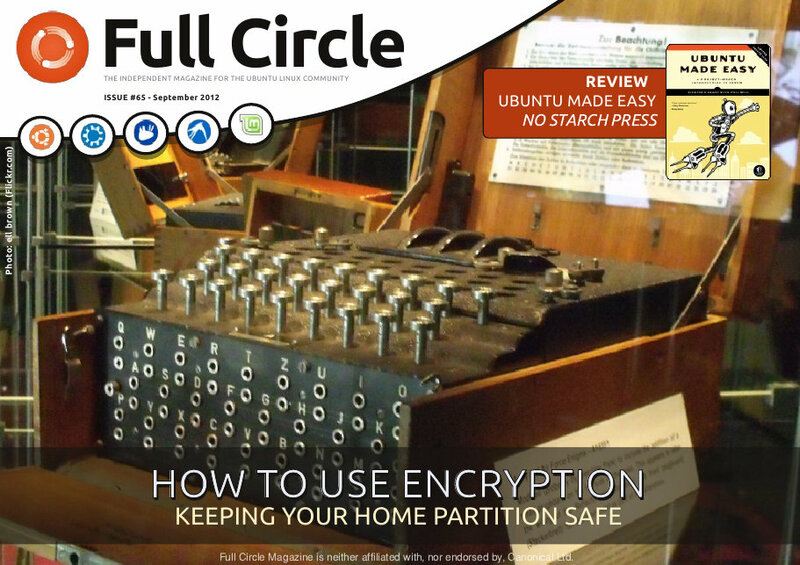 With Full Circle #66 out, I thought I’d have a look back at the numbers for Full Circle #65. Not because they’re amazing or scientifically in depth. No, it’s because I’m bored, and it’s been available for over a month. 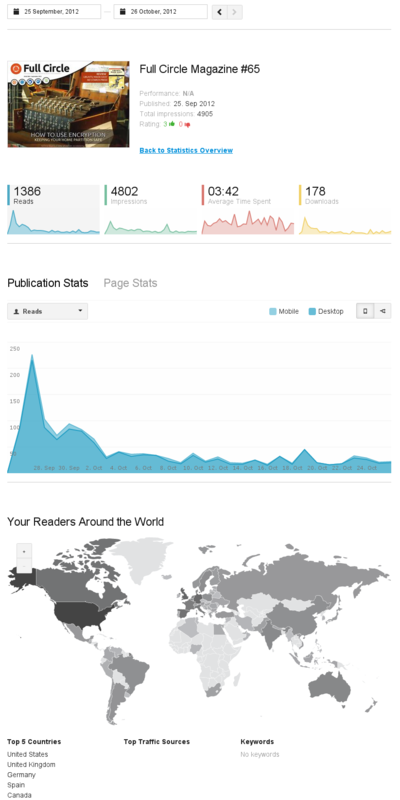 Now, that’s, 14,919 views of the FCM#65 page. That doesn’t include someone, anyone, linking directly to the PDF. 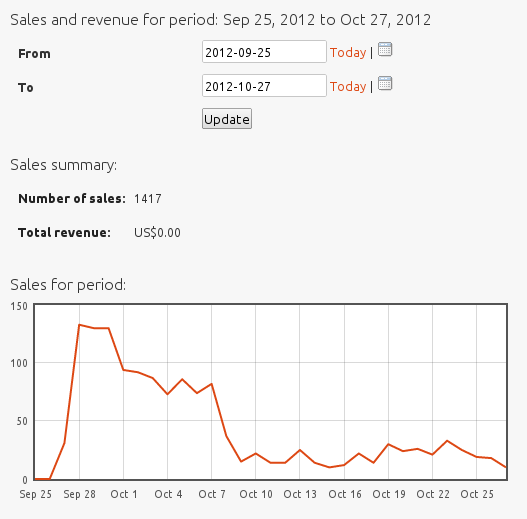 You can see the sharp spike when it was released with about 3,500 page views in one day. Just over 2,000 the following day. 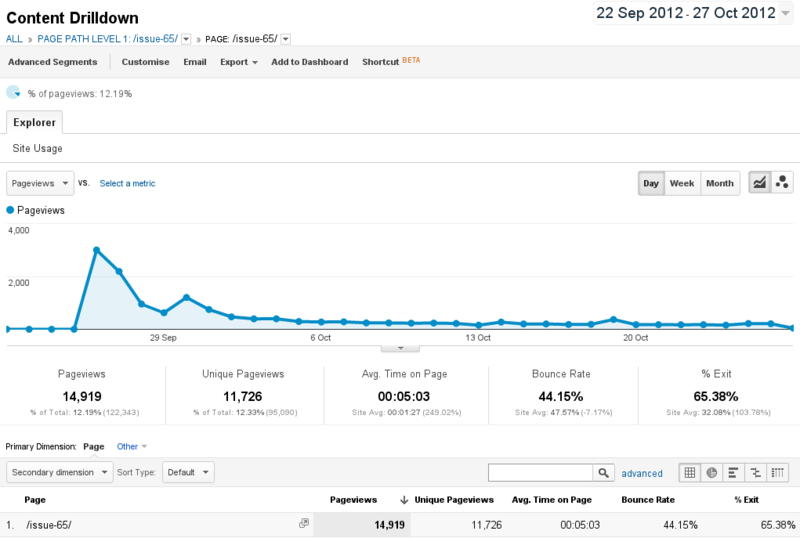 For the next two weeks the FCM#65 page averaged about 250 page views and for the last two weeks (of this graph) it averaged about 150 page views per day. Last, but not least, is Google Currents. While it’s not as popular as the other places it’s still a handy portable edition of FCM that doesn’t take much work to get going. Unlike Jens having to hand code the EPUB edition. That 491 may not seem like much, but it helps promote FCM as we don’t show up in the Google Currents catalogue until we reach over 200 subscribers. If we go conservative and use the 14k from the main site, over 1k reads on Issuu, 1.5k downloads from the USC, and nearly 500 readers on Google Currents… that’s not bad at all! Considering it’s only been out for roughly four weeks. Also, this does not take into account the many translations of FCM, or the EPUB edition. Bear in mind that some issues have been online for longer and have far more downloads. FCM#61, for example, has had over 6,000 downloads in the USC alone. Older issues on Google Currents have almost 1,000 subscribers, and issues in the 50’s range are showing as having 25k page views on the main site. Previous articleThar she blows Cap'n! 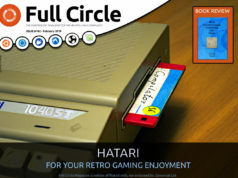 Next articleFull Circle Magazine #67! Thanks for the great magazine, podcast, and web site. I usually keep up with the news via your RSS feed. 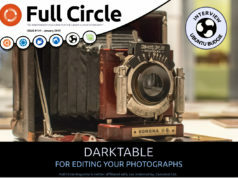 It seems that it has been not working lately, and I was late in finding the latest edtition of the Full Circle Magazine. Keep up the great work! When will the english epub for issue 48 & 49 be available?